If you're quick you might still be able to book onto the Avon Gorge and Down's 'Wild Works of Art' holiday event. Suitable for 8 - 12 year olds, this activity starts at 10am on Thursday 8th August and costs £8.50 per child. Children will have the opportunity to make super cool sculptures and 3D pictures out of wild things, then craft their own paper from natural materials like petals and leaves. If you are too late to book onto this you can still go and get creative outdoors.Gather some friends together and have your own outdoor art party. You can create your own challenges - make a mud animal or a face out of sticks, build a sculpture out of woodland treasures or make a leaf crown. You could even make little people using clay, leaves, seeds and grass, tying it all together with a ribbon or string. Check out our Day 10 blog for more ideas. 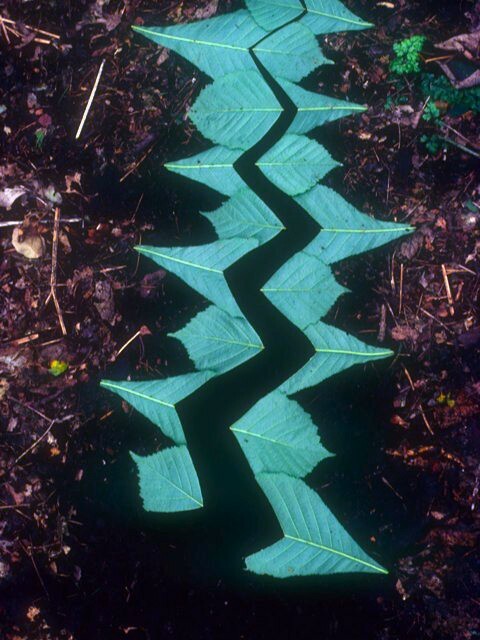 Andy Goldsworthy is an artist who uses natural materials in his work, he even manages to make beautiful leaf hangings by connecting the leaves with thorns. he uses colour and shape to make bold images in the landscape. You may want to have a look at some of his work before you head out and get creative yourself. Whatever you do, be creative, be happy, be inspired and be yourself. Avon Wildlife Safari Day 39 - Insects are fab! Avon Wildlife Safari day 36 - It's Treefest! Avon Wildlife Safari Day 31 - Find a fiddledock! Avon Wildlife Safari Day 26 - Get wet and wild!